This little lump of greyish stone has something very unusual and interesting in its core: a bubble containing water that has been trapped within the rock, maybe for as long as 200 million years. The scientific term for this formation is ‘enhydro’ or ‘enhydrous’ agate. This particular specimen is chalcedony, banded in light grey and white, and it comes from Brazil. In most cases, the liquid within a chamber gradually deposits a sparkling geode of crystals as the rock cools, and any remaining water drains away or evaporates. However, for reasons which I don’t pretend to understand, some rare specimens still contain a bubble of liquid. It’s like a kind of Jurassic chocolate liqueur, only the outer casing is a bit harder! Amazingly, if you shake the stone, you can hear the liquid quietly sloshing around, and if you place a light behind it, you can see the water level. With Verity’s help, I have tried to show you this on video, and capture the sound. I can’t help wondering if air is also captured within. And, if it really is that old, has the water ever been examined for traces of life forms? I’m sure it has, and if there were any discoveries I’m sure we’d have heard of them by now – but it’s a fascinating thought. Some experts cast doubt on whether the water is actually the same age as the stone; in fact, it may have been replaced several times as the rock expanded and contracted with the Earth’s fluctuations in temperature. One website states that the water is still evaporating from the rock, very slowly, through tiny capillaries. I may have hastened it on its journey with lots of shaking, but there still seems to be quite a bit left! 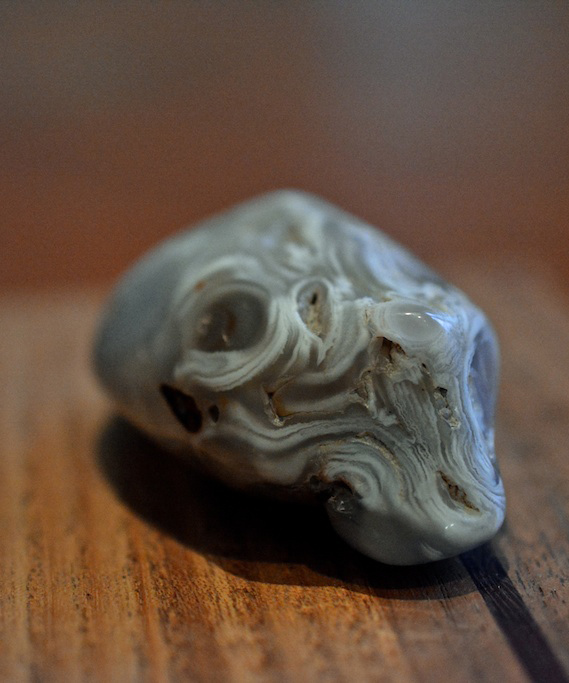 My enhydro agate was supplied by Mr Wood’s Fossils in Grassmarket, Edinburgh. Or visit the amazing standing stones of Callanish! Thanks, Susan! 🙂 I love it, too! I have one about the same size. How very peculiar, it’s amazing that it hasn’t evaporated, even very slowly. That’s true, Lorna – I don’t quite understand this myself. That does kind of suggest the water is more recent. But it’s a tempting fantasy to think it could be that old! How interesting and strange – something for the Cabinet of Curiosities I think! Thanks for sharing. Isn’t it amazing?! It is certainly destined for my cabinet, but I can’t resist keeping it on my desk and playing with it at the moment! Glad you liked it, Nick! 🙂 I just love things like this. How wondrous to hold Jurassic life in your hands!. Beautiful specimen, Jo! There’s still a remote chance it could contain life (in my mind, anyway!) 🙂 Thank you, Carmen! I never knew that there was still water left in some of them! I’ve only ever come across the crystals. Great post, thanks! Thank you, Rachel! I had heard about these stones, but never actually handled one. They’re amazing, aren’t they?! You certainly do, especially with rocks and minerals! There’s so much I don’t know, but I still find them endlessly fascinating. Hi! I have many enhydros and some that I have are ‘failed’ enhydros which have gone dry. The water can leach out of the stones while they are in ‘raw’ form. Once polished and sealed like the one in your video they will remain sealed. If you have raw failed enhydro there is a process to soak them, heat them, soak them and you can get the water back in. So, chances are the water isn’t exactly as old as the rock but these are still the coolest!!! Holding Air, Water and Solid in your hand at the same time! Hi Luke, this is very interesting, and thank you so much for sharing your knowledge! I had no idea that you could do that. I wouldn’t have thought it possible to get the water back in! You’re right, they are still amazing, no matter how old the water is – a miracle of nature. I was trying to find out about ‘enhydros’ myself, and I read somewhere that gas bubbles (or oil, not sure which) could also be found in Herkimer diamonds. I’ve got two tiny ones of these, so I got a magnifying lens on them, and found loads of tiny little yellow ‘bubbles’. Do you know what these might contain? An enhydro agate was just recently discovered, accidentally by a customer, at Fargo Rocks, Fargo, N.D. Don cut the agate but did not notice the moisture trapped inclusion. A lady looking to purchase the agate pointed it out. The water inside probably isn’t very old. You can get ‘dry’ enhydros and soak them. They will take the water in provided they have not been polished or sealed. As they formed in river beds in Brazil the water would transfer in and out over millions of years. Thank you for this insight! So, not so old after all. A lovely thought, even so, to imagine it collecting water and releasing it repeatedly over so many millions of years.